In late summer, we had a few grasshoppers eating my hibiscus bush. I left them alone as there were less than 10, and the hibiscus has never done well anyway. 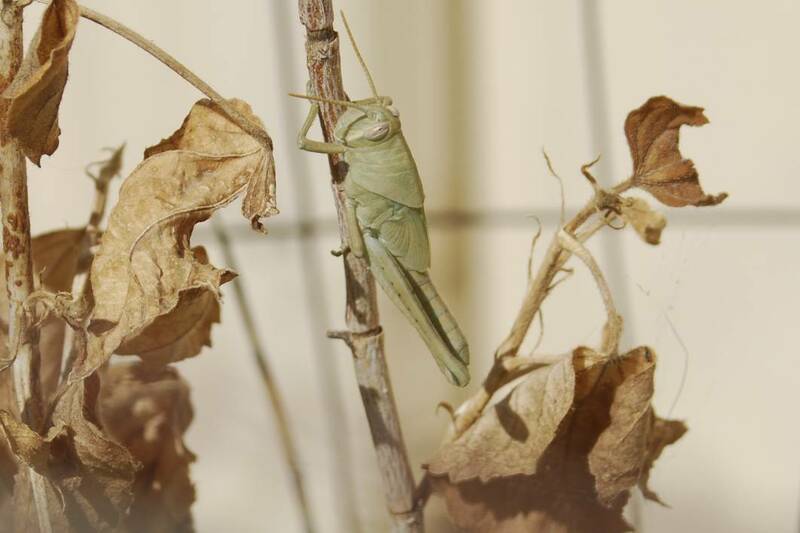 Some time in late fall, I noticed that there was still one grasshopper left on the bush and I thought nothing of it. Some time in December, we had a freeze one night, and all the leaves on the hibiscus turned brown and shriveled. A couple of days later, I saw the grasshopper again. Looking closer, I realized that one of its back legs was missing; I thought it might be dead. But when I got too close, the grasshopper took a flying leap onto the ground, which startled me. So I left it alone. A couple of days later, it was still there and back on the hibiscus. 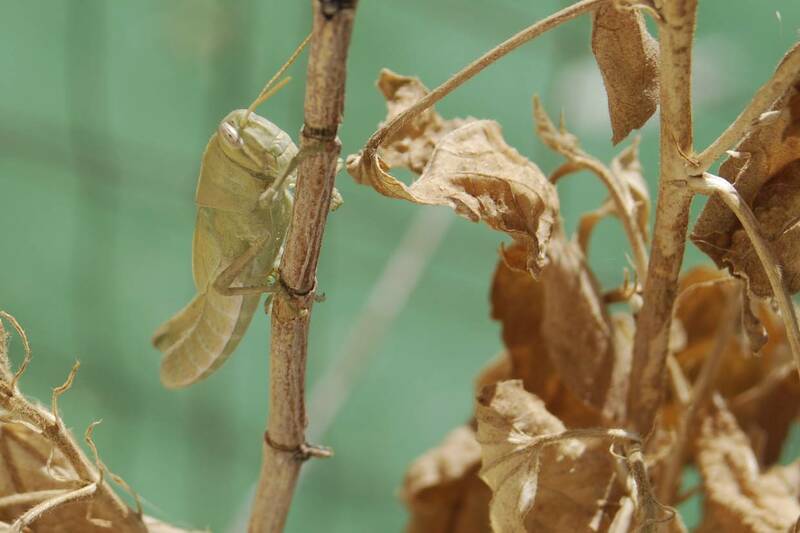 I didn’t know what to make of this as I know absolutely nothing about grasshoppers except that they can strip foliage off a plant in a heartbeat. I started paying attention to this little critter. Every time I thought it was dead, it moved to another part of the plant. I can’t imagine where this creature was getting food or moisture as the hibiscus leaves were definitely brown and shriveled. Then we had rain, and wind, and three nights of lows in the teens. I was sure that would have killed off the grasshopper. Nope, still there. Every time I thought it must be dead, it was on a different part of the plant when I checked. I started checking every day to see where it was; it was always on the hibiscus bush, sometimes at the top of the stalk and sometimes lower down. Sometimes it looked like it might be dead as the bright green faded to sort of a greyish-green. Two days ago, I couldn’t find it anywhere on the hibiscus. I eventually found the grasshopper; it had moved over to a sage bush in the next pot. The sage bush is also in bad shape from the deep freeze we had. Yesterday, the grasshopper was still there and looking a little brighter green. Today, the grasshopper is nowhere to be found. I don’t know where this little critter ended up, but it sure was persistent! So this is one mystery I can’t solve: why did the grasshopper hang around for so long; and how did it stay alive all this time? Well, now it’s back on the hibiscus! Notice the missing right back leg! !